Two Chinese military pilots rode a Long March 2F rocket into orbit Sunday, heading for the Tiangong 2 research lab to conduct experiments and practice procedures to be used on China’s future space station. 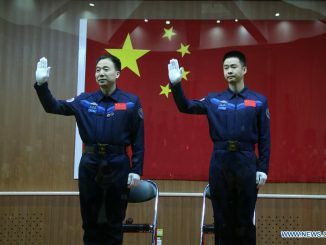 Commander Jing Haipeng, a veteran of two previous space missions, and rookie flight engineer Chen Dong were fastened inside the Shenzhou 11 spacecraft for the 10-minute ride into orbit. 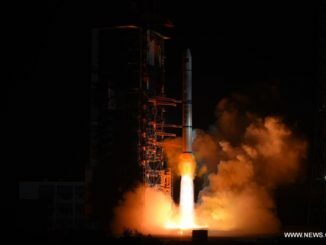 The Long March 2F rocket’s first stage engines and four liquid-fueled boosters, burning a combination of hydrazine and nitrogen tetroxide, ignited after an apparently smooth countdown to propel the 191-foot-tall (58-meter) launcher into space at 2330:31 GMT (7:30:31 p.m. EDT) Sunday. Live video of the liftoff broadcast by China’s state-run CCTV news channel showed the rocket climbing into a clear sky over the Jiuquan satellite launching center in the Gobi desert, where liftoff occurred at sunrise Monday, the time determined by the orbital track of Shenzhou 11’s target in orbit. Jing and Chen gave a salute to their ground team moments before launch, and a camera mounted inside Shenzhou 11’s cabin showed the astronauts monitoring cockpit displays and waving during the trip into orbit. 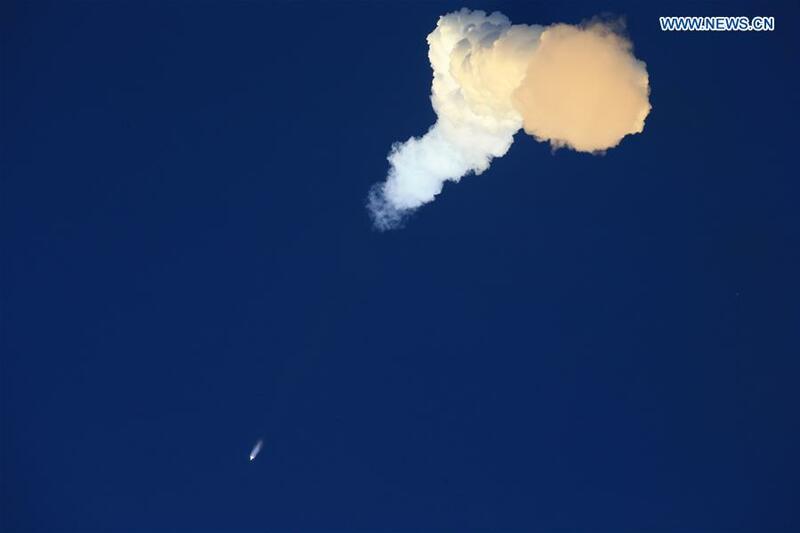 The Long March 2F’s crew escape tower, four boosters and first stage fell away in the first three minutes of the flight, and an aerodynamic fairing jettisoned moments later as the rocket’s second stage powered the 8-ton Shenzhou 11 spacecraft east from Jiuquan. 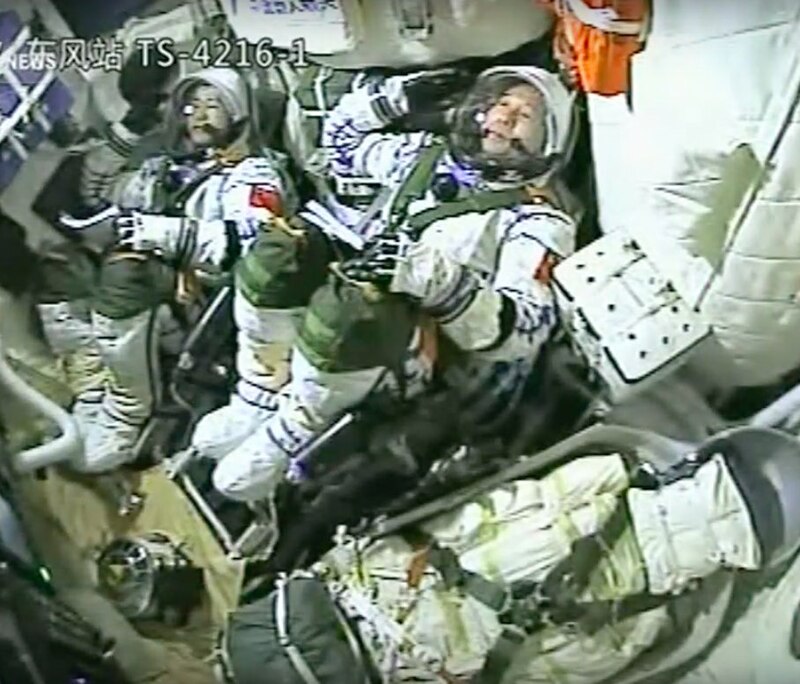 After traversing the Chinese mainland, the second stage main engine switched off and deployed Shenzhou 11 as live video from an on-board camera showed the vehicles sailing high above Earth. Within a few minutes, Shenzhou 11 extended its two solar array wings, the first step in the ship’s two-day chase of the Tiangong 2 research module. Gen. Zhang Youxia, chief commander of China’s military-run human spaceflight program, declared the launch a success. Shenzhou 11 is China’s first piloted space mission in more than three years, and plans call for the astronauts to double the length record for the country’s longest-duration spaceflight set in 2013. Jing, a 49-year old Chinese fighter pilot, is on his third flight in orbit after serving on the Shenzhou 7 and Shenzhou 9 crews in 2008 and 2012. He has logged 15 days in orbit going into the Shenzhou 11 mission, and will become China’s most experienced astronaut by the time he lands. 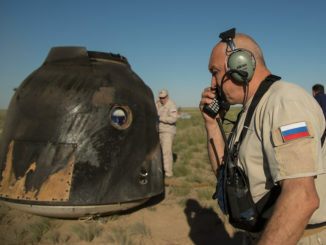 While Jing is a seasoned space flier by Chinese standards, he tried to put his accomplishments in perspective in comparison with astronauts and cosmonauts from the United States and Russia. Chen said the schedule for the Shenzhou 11 mission is “very tight” with experiments and technological demonstrations. Shenzhou 11 is on course for an automated docking with the Tiangong 2 space lab Tuesday, forming a 60-foot-long (18-meter) mini-space station. Jing and Chen will stay there for 30 days, according to Wu Ping, a spokeswoman for the China Manned Space Engineering Office. When the transit time to and from Tiangong 2 are factored in, the Shenzhou 11 astronauts will spend around 33 days in orbit before returning to Earth in mid-November. Tiangong 2 has living quarters, medical gear, provisions and experiments for the two-person Shenzhou crew. China launched the Tiangong 2 laboratory Sept. 15, and ground controllers completed a checkout of the new research module and raised its orbit to an altitude of around 244 miles (393 kilometers), the prescribed docking orbit for Shenzhou 11. Tiangong 2 is China’s second human-rated research module, following the similar Tiangong 1 spacecraft launched in 2011. The latest spacecraft features several upgrades, including a robotic arm and refueling systems to test out technologies for China’s planned space station. Tiangong 1 is no longer operational, and it is expected to make an uncontrolled re-entry into Earth’s atmosphere in late 2017. Two Shenzhou crews visited Tiangong 1: Shenzhou 9 in June 2012 and Shenzhou 10 in June 2013. 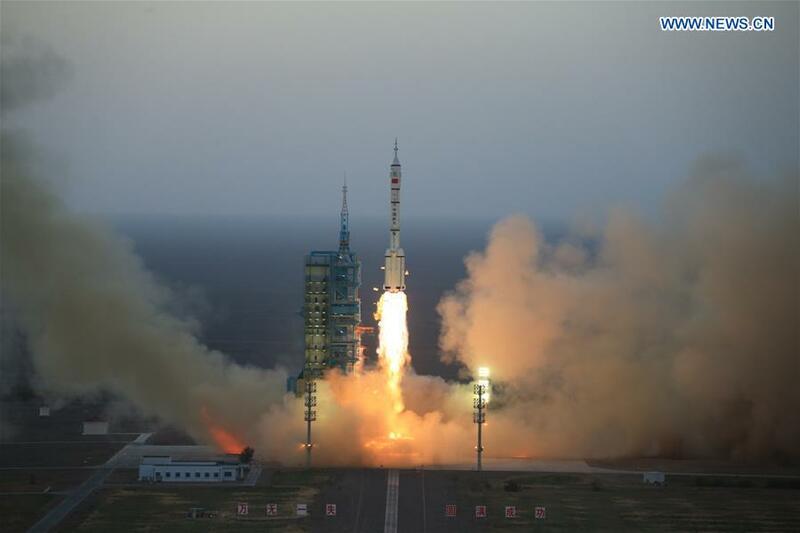 Each mission stayed in space for around two weeks, building on achievements on earlier Shenzhou flights. Shenzhou 11 is China’s sixth human spaceflight since Yang Liwei made a one-day orbital trip aboard Shenzhou 5 in 2003 to become the first Chinese citizen in space. China accomplished more feats on the Shenzhou 6 and 7 missions in 2005 and 2008, including the country’s first spacewalk by astronaut Zhai Zhigang. China sent up the Tiangong 1 module in September 2011, and the Shenzhou 8 spacecraft flew to the space lab later that year without any astronauts on-board to conduct a series of automated docking demonstrations, laying the foundation for Shenzhou 9 and 10, which flew with the first female Chinese astronauts. “With the increase of the flight time, the adverse effects of the weightless environment in space on the human body will be significant, especially the decay of the cardiovascular function will be more prominent, and there will be a certain degree of muscle atrophy and bone loss,” Wu said. The technical parameters of the Shenzhou 11 spacecraft are nearly identical to previous Shenzhou missions, according to Wu, but ground teams improved techniques for loading cargo into the capsule to fit more supplies for the longer-duration flight. One experiment in plant biology involves the growth of lettuce in space. China will launch the core module of the space station as soon as 2018 on a Long March 5 rocket, a heavy-lift booster scheduled for its maiden test flight in early November. Chinese space officials consider the Shenzhou 11/Tiangong 2 mission part of the second phase of the country’s methodical three-step human spaceflight development program. 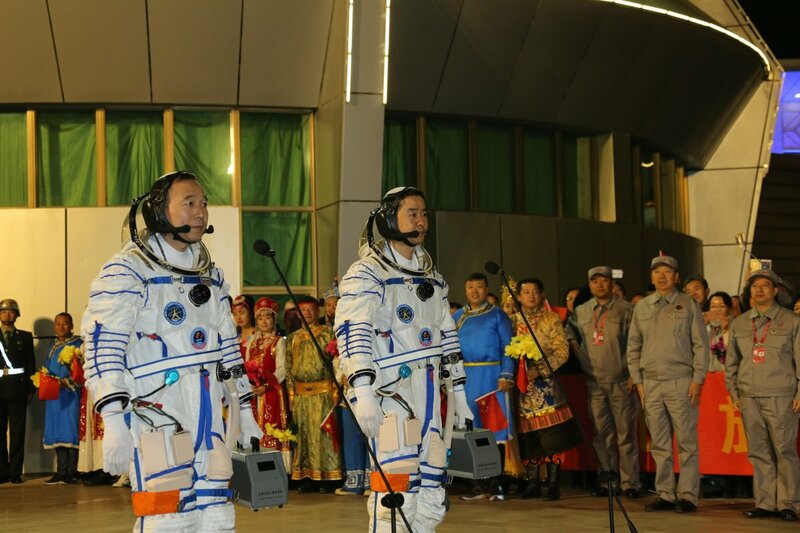 The first phase ended with the demonstration of safe basic Shenzhou solo operations, while the current emphasis is on practicing for longer astronaut stays in orbit. The third part will come with the launch and assembly of a Chinese space station capable of hosting a permanent crew of three in six-month increments, and up to six astronauts for shorter periods. Several piloted spaceships and cargo missions will visit the space station’s core module after its 2018 launch, then China plans to add two experimental laboratories, eyeing completion of the complex by 2022.